Our Instagram page Faces of England features the best stories about inspiring people from around the country. 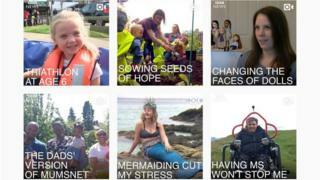 Some of the people whose tales we've featured already include a six-year-old girl with cerebral palsy whose completed a triathlon, the fathers trying to make a dads' version of Mumsnet, a woman who became a mermaid to tackle her anxiety, and a mum-of-three who shed nearly half her bodyweight when she changed her lifestyle and took up weight training. Follow our account for the latest posts or use the hashtag #facesofengland if you've got a story to tell. And if you like photography we also post daily on Instagram as England's Big Picture.